The USB-SP2 is a USB powered stereo headphone adapter system utilizing a USB audio and control interface. It can be used to adapt standard headphones and microphones to connect to computers via the USB port. Audio outputs are stereo headphone. 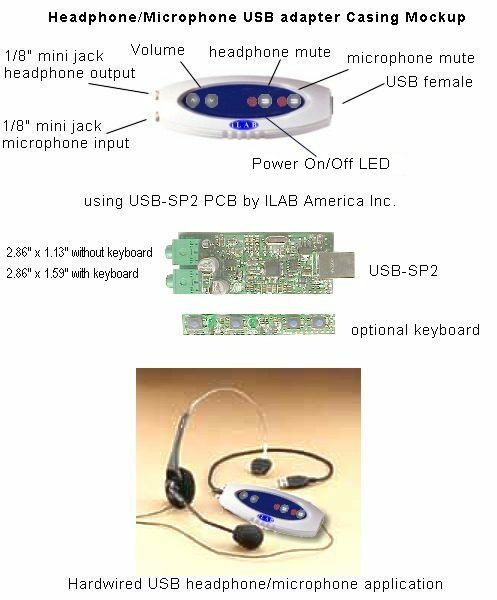 Audio inputs are USB and microphone. The microphone input is sent via the USB port to the PC. Volume and mute control can be operated by either the PC or the optional front panel of the USB-SP2. This allows for central control , avoiding mismatched volume levels in common powered speakers/PC's. The USB-SP2 uses the standard Windows USB drivers. 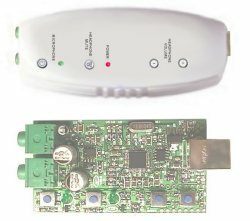 The identifying code can be easily modified to display any company or brand when the USB driver detects the USB-SP2. Ideal for creating brand recognition for headphone products. Note: USB-SP2 is a PCB subassembly. Plastic casing shown for example only and not supplied as standard.